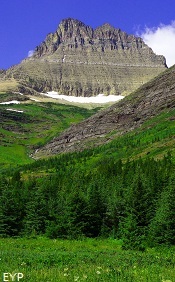 A view from the Swiftcurrent Pass Trail, Glacier National Park. 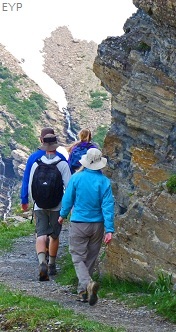 Hikers working their way down the Swiftcurrent Headwall. 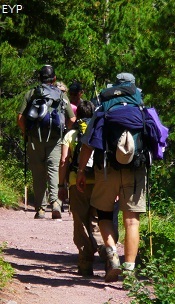 The first section of the trail is flat as a pancake and offers amazing scenery, such as Fisher Cap Lake, Red Rock Lake and Red Rock Falls. 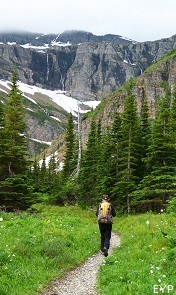 The second portion of the trail is still relatively flat and provides a longer hike to Bullhead Lake and the base of the Swiftcurrent Headwall that houses Swiftcurrent Glacier. 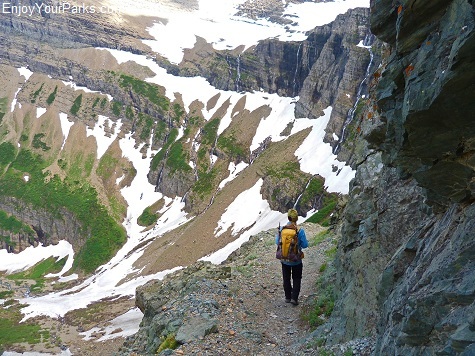 The third section of the trail is quite strenuous because it takes you directly up the Swiftcurrent Headwall, where Swiftcurrent Pass awaits you on the continental divide. 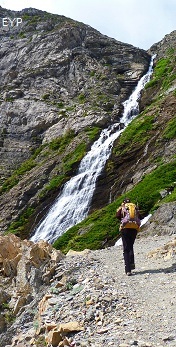 This is the strenuous section of the trail, as it climbs over 2,300 vertical feet in less than three miles. 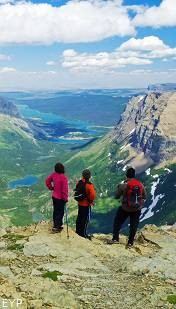 This photo was taken from the summit of Mount Henkel, above the Swiftcurrent Motor Inn. 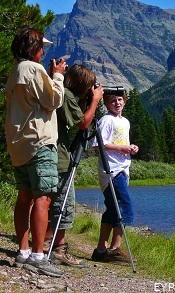 It gives you a good look at the Swiftcurrent Valley and the location of some of the major attractions along the trail. 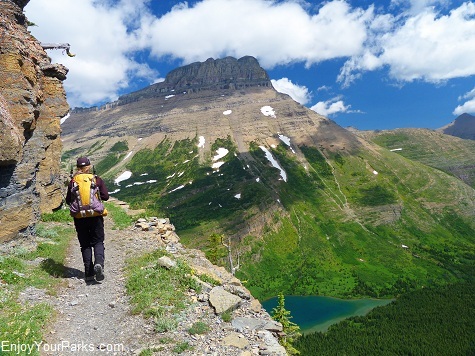 If you want to REALLY get a workout, you can hike on a trail that takes you all the way to the summit of Swiftcurrent Mountain, which is another 1,000 vertical foot climb in just over 2 miles! 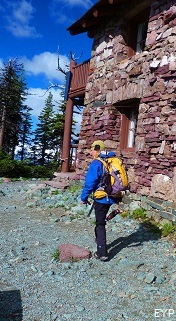 If you don't want to hike to the summit of Swiftcurrent Mountain, you have the option of either heading back to the trailhead at the Swiftcurrent Motor Inn parking lot, or keep going another mile to the iconic Granite Park Chalet which is located on the west side of the continental divide. 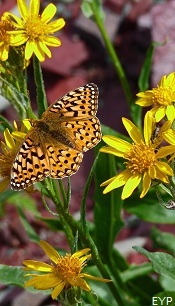 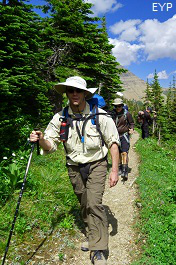 The beauty of the Swiftcurrent Pass Trail is that you can choose how far you want to go and how hard you want to work. 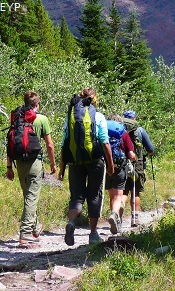 It truly is a trail that varies from being extremely easy to extremely strenuous, and you can decide what level you want to pursue. 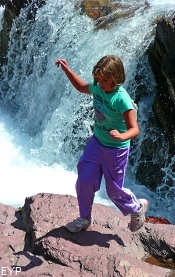 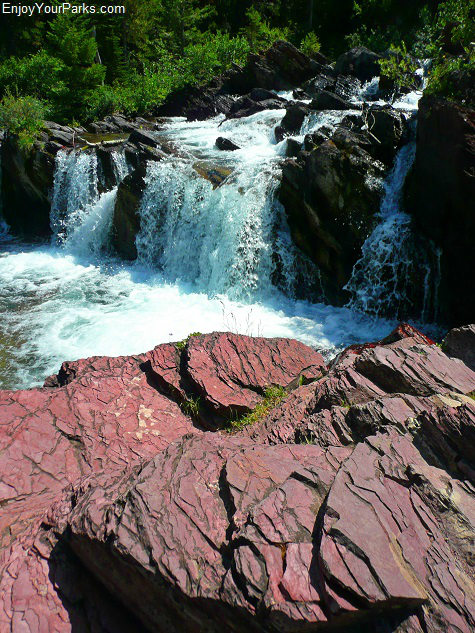 Red Rock Falls is the easiest hike in Glacier National Park, and is a very popular day hike in the Many Glacier Area. 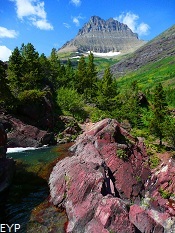 The Hike to Red Rock Falls in the Many Glacier Area in Glacier National Park is very easy and extremely enjoyable. 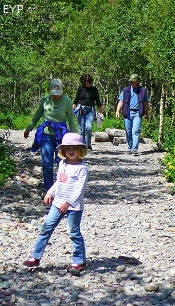 This is truly a hike for all ages! 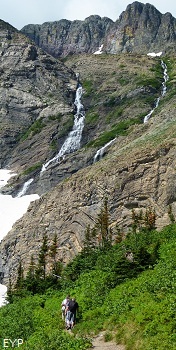 To get to Red Rock Falls, you will walk straight west along the Swiftcurrent Pass Trail, which meanders directly up the middle of the magnificent Swiftcurrent Valley. 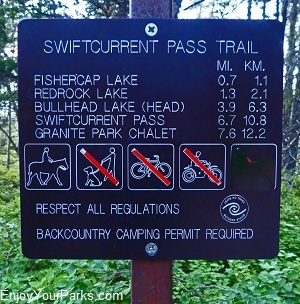 The actual trail head begins at the Swiftcurrent Motor Inn parking lot. 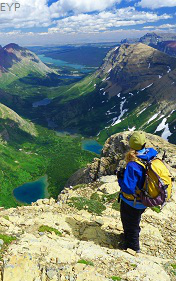 Another view of the Swiftcurrent Valley from the summit of Mount Henkel. 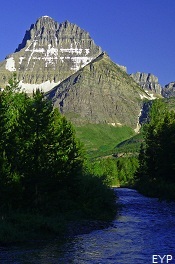 The large peak to the right is Mount Wilbur. 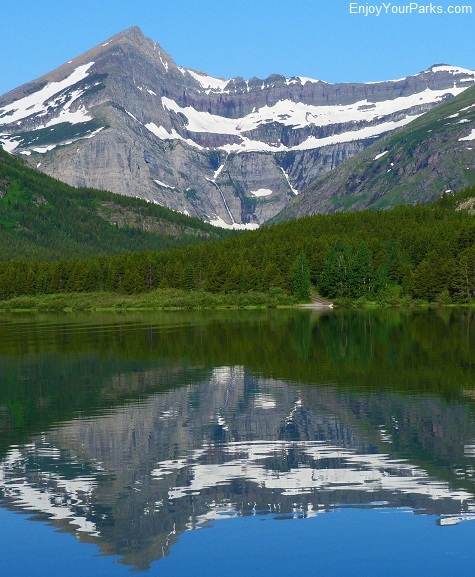 You will pass two lakes, the first being Fisher Cap Lake, and the second being Red Rock Lake. 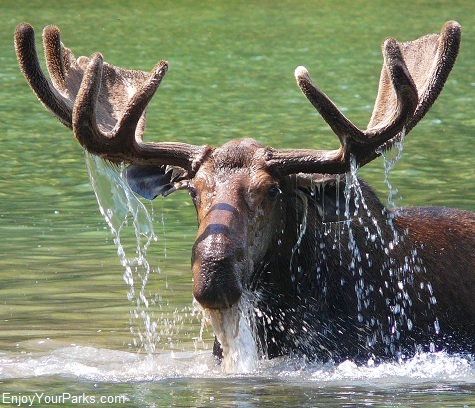 Both are great places to see moose, so make sure you stop at these lakes and take a look! 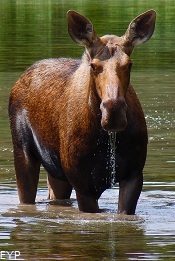 And don't forget to check Fisher Cap Lake on the way back too- you never know when a moose gets hungry and plops in the lake to eat! 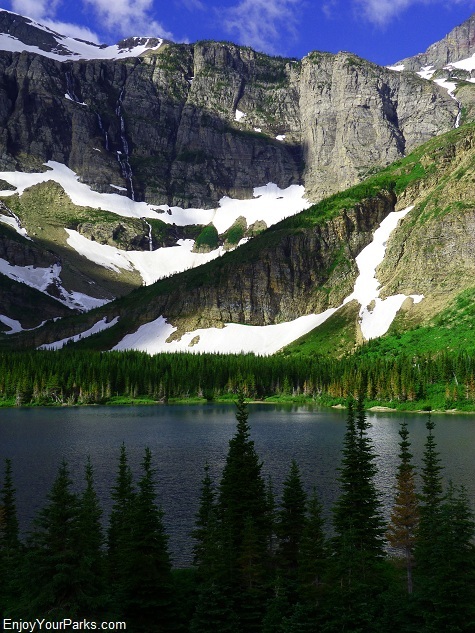 Fisher Cap Lake is the first lake you'll pass on your Red Rock Falls hike, but you can't see the lake from the trail! 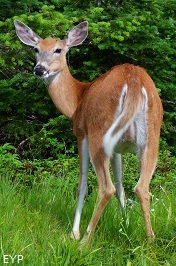 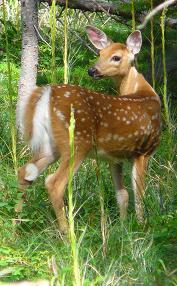 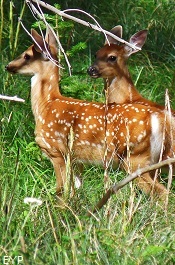 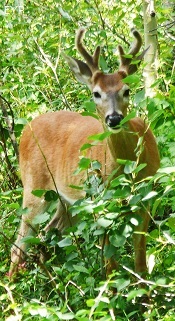 So look for a really small sign to your left within the first quarter mile of your hike. 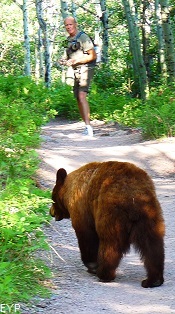 It comes fast, so be on the lookout for it. 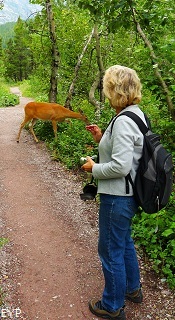 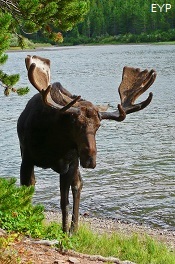 Follow the short trail down to the shore of the lake, and look for moose. 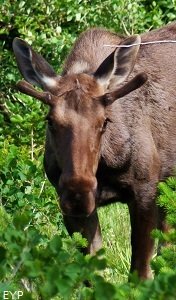 A moose enjoying a snack in Fisher Cap Lake. 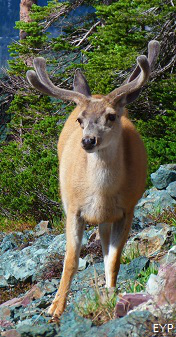 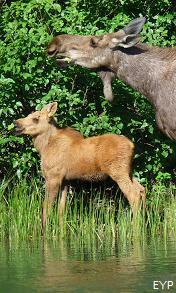 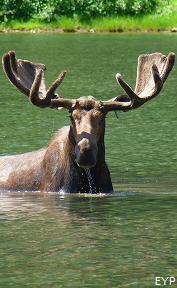 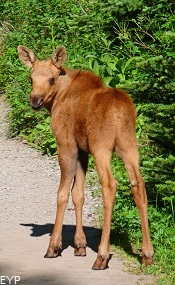 Red Rock Lake is also a good place to see moose, and is the next lake you'll pass along your hike to Red Rock Falls. 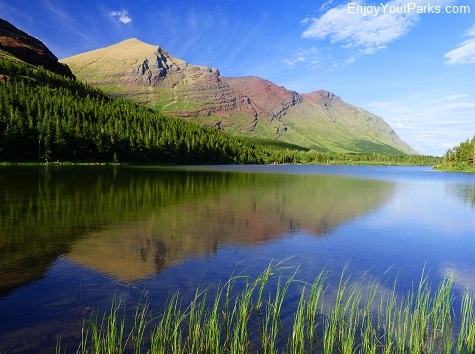 This gorgeous lake is right along the trail, so you can't miss it! 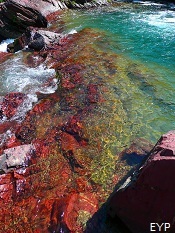 Red Rock Lake is yet another treat along the trail to Red Rock Falls. 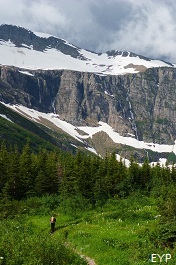 The Swiftcurrent Headwall looms in the distance as Shannon hikes along Red Rock Lake on her way to Red Rock Falls. 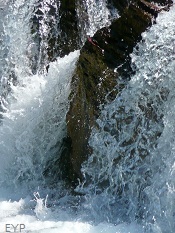 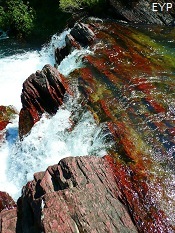 Once you get to Red Rock Falls, enjoy the beauty of the water and the deep red-colored rocks. 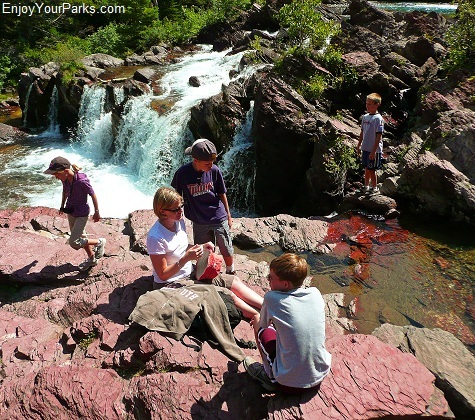 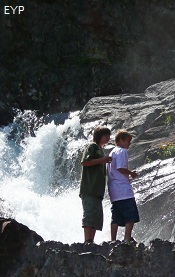 It's a great place to have lunch, and kids of all ages will LOVE to play on the rocks. 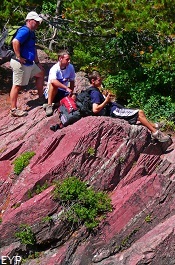 The great thing about the Red Rock Falls hike is the trail is flat as a pancake. 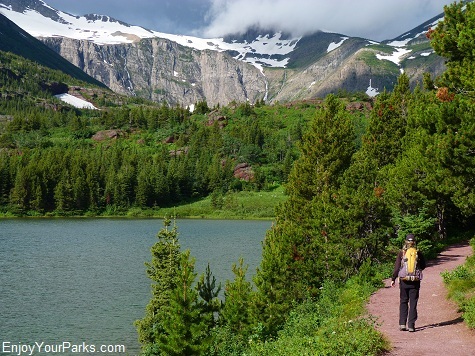 In 1.8 miles, the trail only climbs 100 feet! 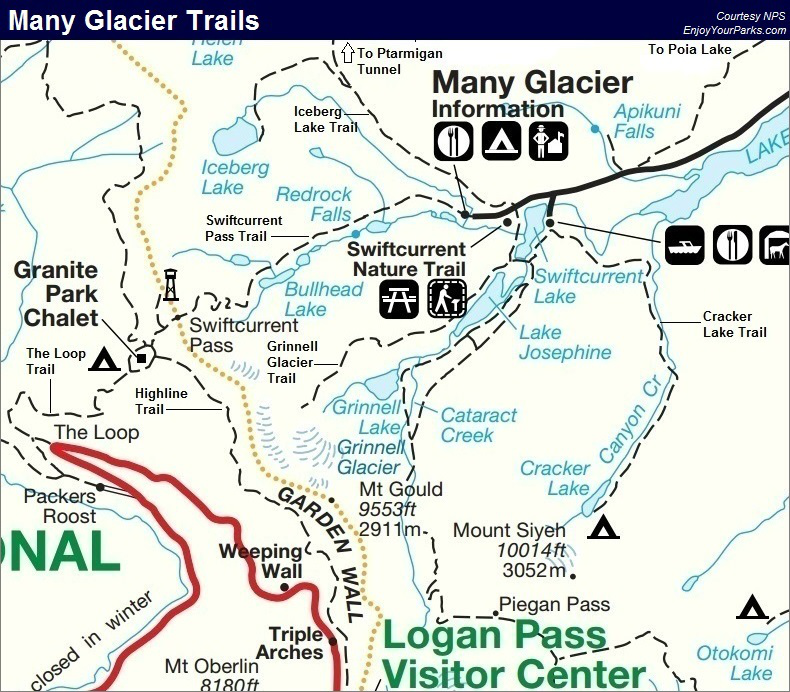 So this is a fantastic trail for those visitors who aren't in the best physical condition, or if you're trying to recover from a more strenuous hike the day before and you're a little sore. 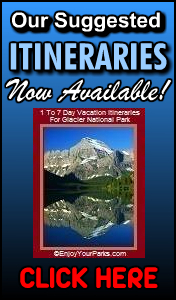 Whatever the case, you will really enjoy this laid back, simple hike through the center of Many Glacier Valley! 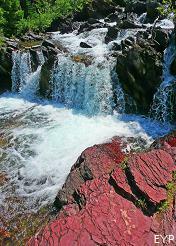 Red Rock Falls in the Many Glacier Area is a great place to hang out and enjoy a nice lunch. 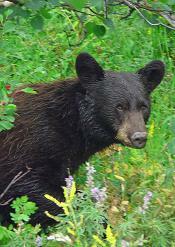 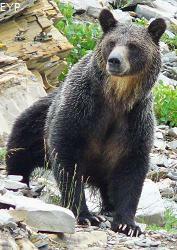 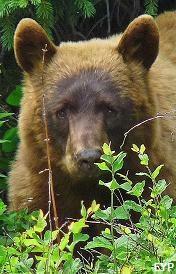 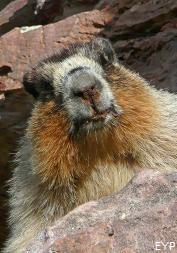 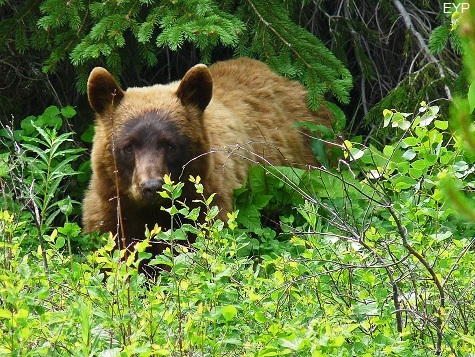 Black bear love the Red Rock Falls Area, so talk loud to let them know you're there! 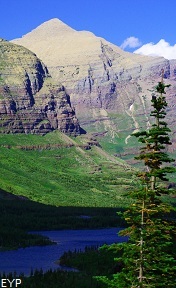 The Swiftcurrent Headwall looms over Bullhead Lake. 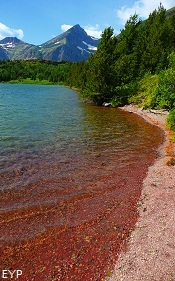 Bullhead Lake is yet another gorgeous lake found along the Swiftcurrent Pass Trail in Glacier National Park. 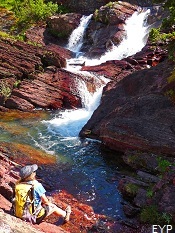 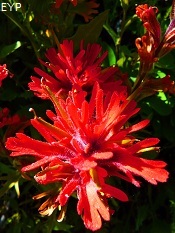 To get there, you simply keep walking up the trail once you've visited Red Rock Falls. 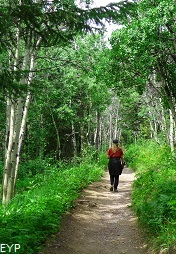 The trail is still relatively flat, and the scenery is breathtaking the entire way. 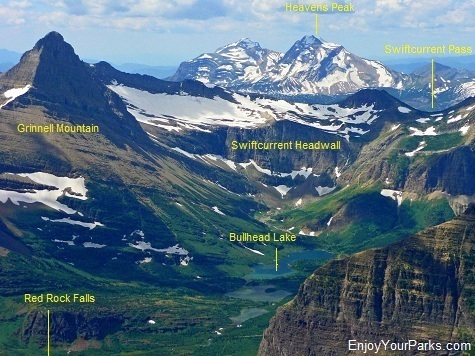 Bullhead Lake is a beautiful lake that rests just below the Swiftcurrent Headwall. 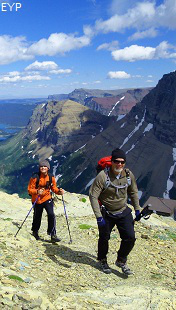 Just beyond Bullhead Lake, the strenuous hike begins up this headwall. 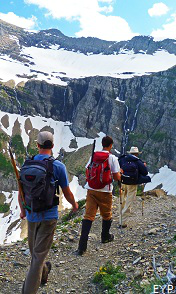 You will climb over 2,200 vertical feet in less than three miles! 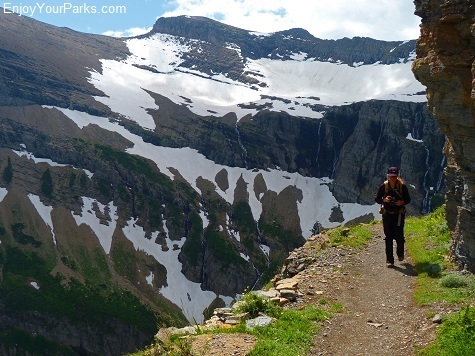 The trail climbs up the Swiftcurrent Headwall through a series of switchbacks. 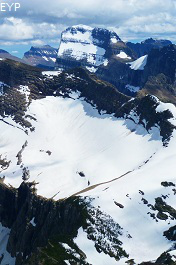 The glacier high on the headwall behind Shannon is the famous Swiftcurrent Glacier. 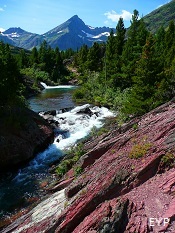 This section of the Swiftcurrent Pass Trail is known as "The Devils Elbow". 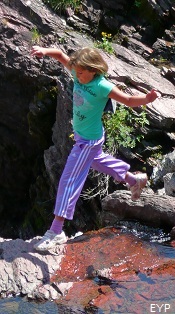 The ledge is hundreds of feet above the valley below, so don't trip! 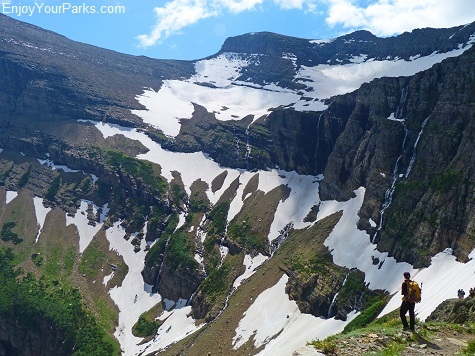 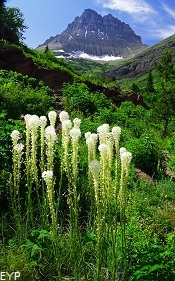 The Swiftcurrent Headwall along the Swiftcurrent Pass Trail is a remarkable sight! 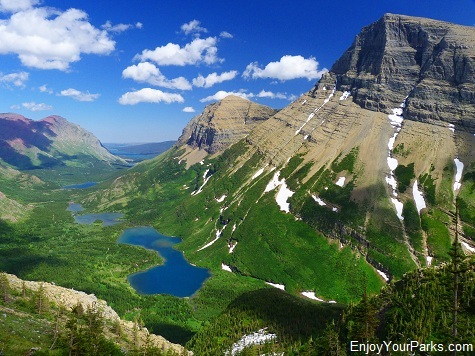 This is the view of the Swiftcurrent Valley once you get past "The Devil's Elbow". 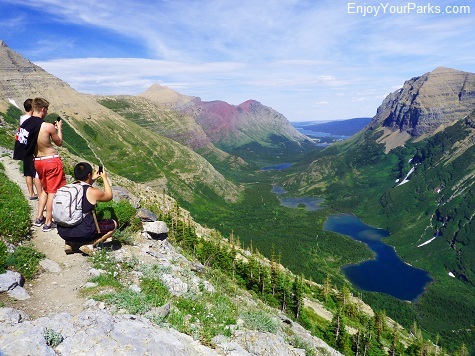 Like these hikers, you'll definitely take some photos here! 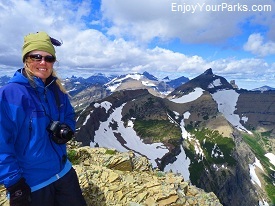 Shannon is standing on "The Perch", and is located just above the headwall along the Swiftcurrent Pass Trail in Glacier National Park. 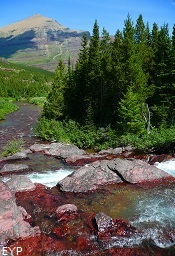 Another view from "The Perch" along the Swiftcurrent Pass Trail. 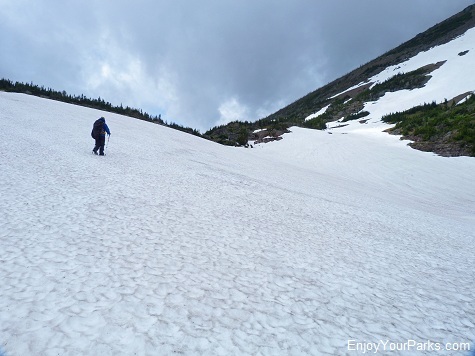 We always encounter snow early in the season once we've climbed above the Headwall. 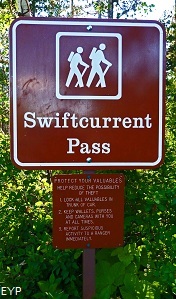 Shannon is just about to reach Swiftcurrent Pass. 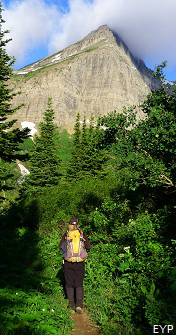 Just a vew more steps and Shannon will be standing on Swiftcurrent Pass. 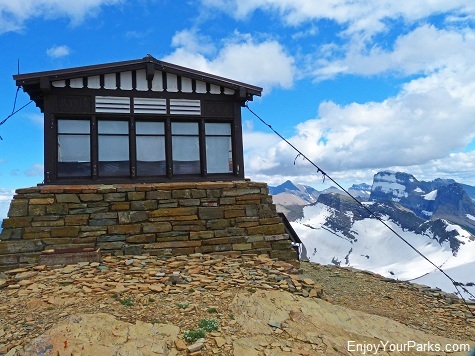 If you want to keep going west from the Swiftcurrent Pass for just about a mile, you will be greeted by the famous Granite Park Chalet. 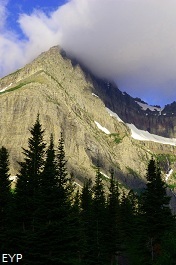 was on horseback and pack train, and each night the group would stay at a different chalet that was strategically placed throughout Glacier Park. 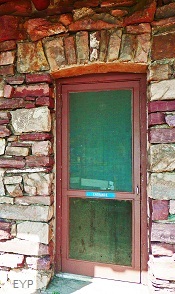 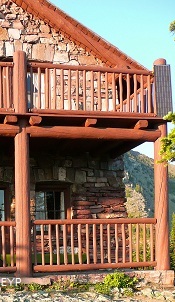 The Granite Park Chalet is one of those original chalets, and is a national treasure. 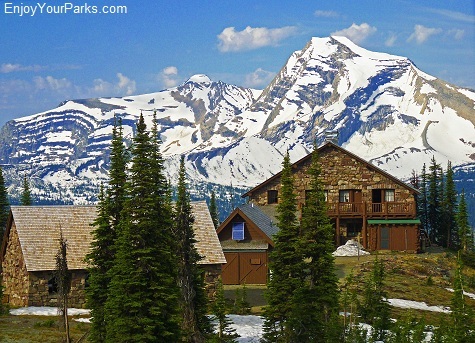 The Granite Park Chalet is located about a mile west of Swiftcurrent Pass, and is truly a special treat to visit and explore. 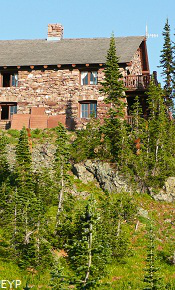 This is a view of the Granite Park Chalet from Swiftcurrent Pass. 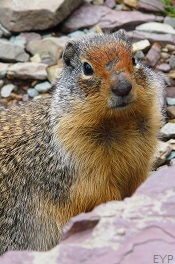 The easiest way to reach the Granite Park Chalet or Swiftcurrent Pass is take a shuttle to Logan Pass on the Going-to-the-Sun Road and hike the Highline Trail 7.6 miles to the Granite Park Chalet. 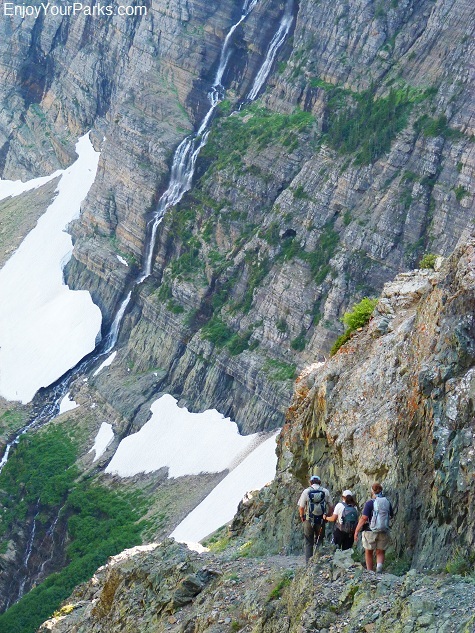 This hike climbs only 200 feet in total vertical elevation. 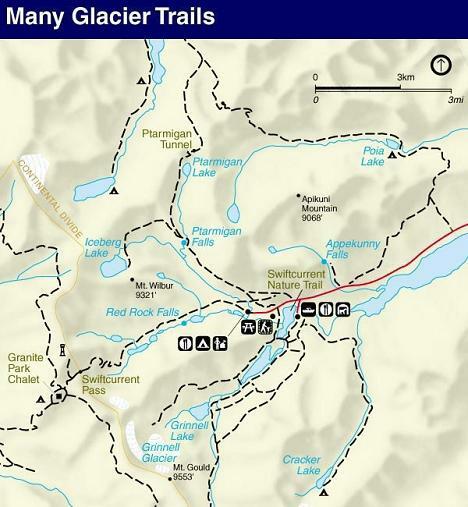 Then, on the same day or if you want to stay the night at the chalet, take the trail east to Swiftcurrent Pass and then walk DOWNHILL all the way to the Swiftcurrent Motor Inn in the Many Glacier Area. 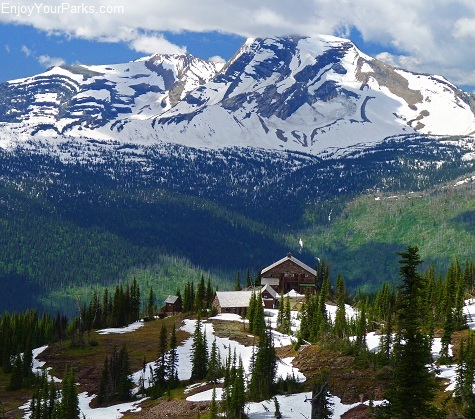 The Granite Park Chalet is a great place to spend the night in the backcountry of Glacier National Park. 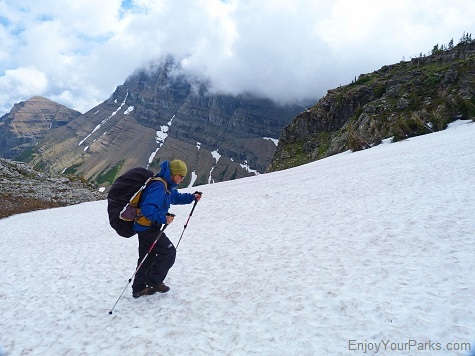 When we see visitors with their overnight packs on and they are heading west from the Swiftcurrent Motor Inn toward the steep headwall of the Swiftcurrent Pass Trail we feel sorry for them and frustrated at the person who recommended this route to get to the chalet. 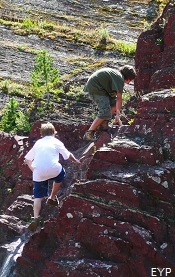 They are needlessly climbing several thousand feet in vertical elevation. 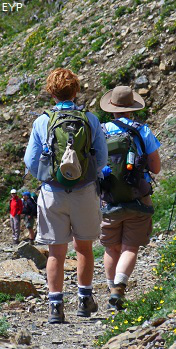 It's absolutely the wrong way if you are carrying an overnight pack! 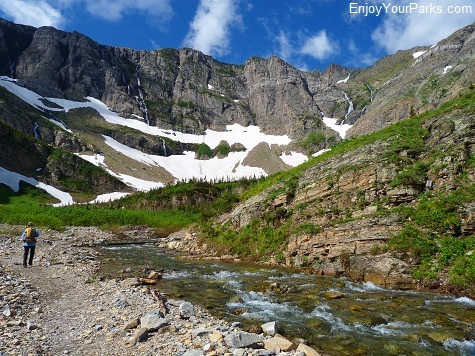 Directly on Swiftcurrent Pass, there is a well marked trail that heads to the right (when facing west) which takes you up one thousand vertical feet in just 1.2 miles to the summit of Swiftcurrent Mountain! 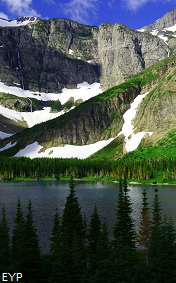 This is a view of Swiftcurrent Mountain reflecting in Swiftcurrent Lake from the Many Glacier Hotel parking lot. 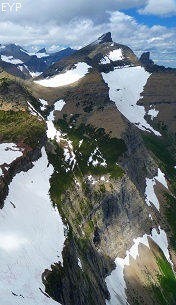 The Swiftcurrent Headwall and Swiftcurrent Pass are to the left of the mountain, out of view. 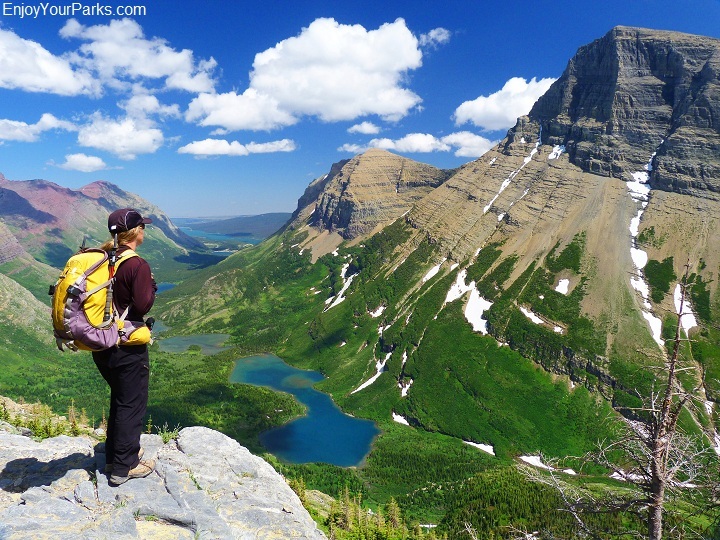 The views from the Swiftcurrent Mountain summit are spectacular and well worth the effort. 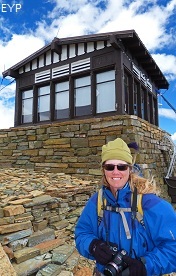 This is a rare opportunity for those outdoor enthusiasts who would love to stand on a major summit but are not mountain climbers. 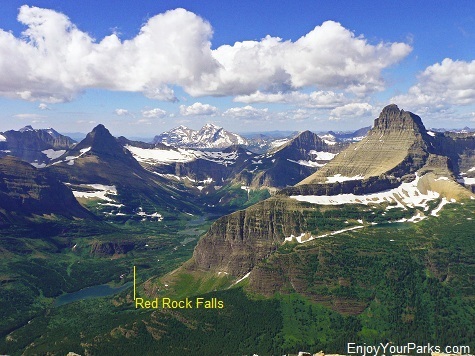 The view from the summit will absolutely take your breath away. 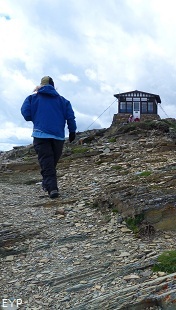 There is a fire lookout tower on the summit of Swiftcurrent Mountain that is occupied during the fire season every year. 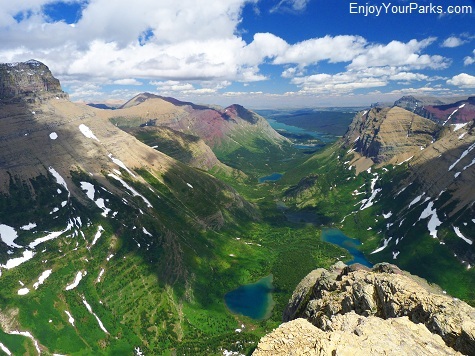 This is the classic view of the Swiftcurrent Valley from the summit of Swiftcurrent Mountain. 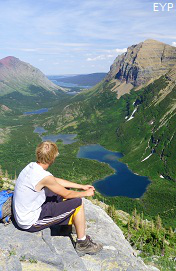 This is the view looking south from the summit of Swiftcurrent Mountain. 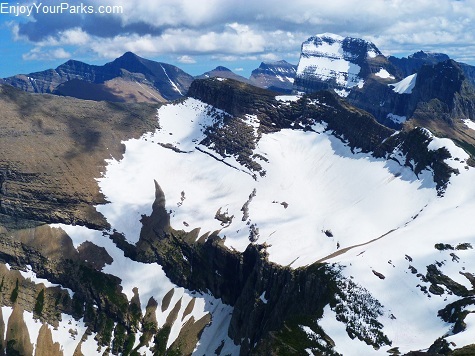 The large glacier in the foreground is Swiftcurrent Glacier and below it is the Swiftcurrent Headwall that you hiked up to get here. 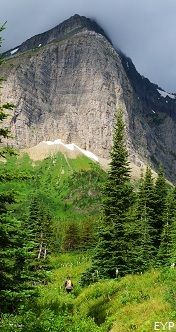 In the background looms the mighty Mount Gould. 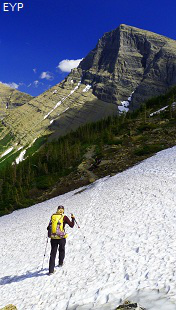 Shannon heading back down the Swiftcurrent Headwall towards the Swiftcurrent Motor Inn after a great day on the trail. 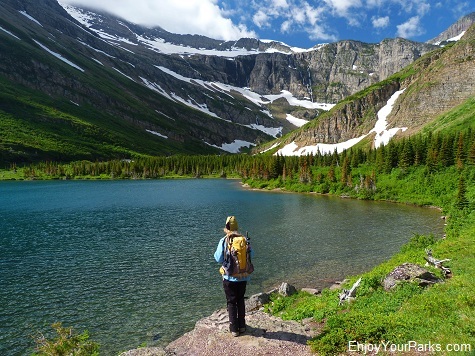 For helpful suggestions on what to bring and what to wear on your hike to Swiftcurrent Pass, check out our informative E-Book "The Ultimate Checklist" as well as our Suggested Itineraries.